The modern world is a toxic place. There are over 150,000 man-made toxic substances present in the environment that were not here a hundred years ago. Everyone is exposed and toxins accumulate. Reducing the burden of toxins is a matter of eating organic food whenever possible, filtering water, changing air filters at home and workplace regularly, being conscious of things applied to the skin and staying healthy to avoid drug use (drugs can be a major source of toxins causing subtle liver damage). The primary organ responsible for detoxification is the liver. A healthy liver is essential for optimal health. Side effects: Milk thistle is extremely well tolerated. Negative reactions are rare. 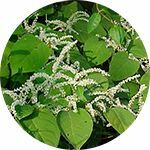 Japanese knotweed is an excellent source of resveratrol while offering potent antioxidant properties, and maintaining cardiovascular, nervous system, and liver health.